There are two main ways you can help support our programs: by getting involved, or by donating. If you are interested in supporting The Goodis Center by volunteering, interning, providing pro bono services, or otherwise joining our causes, please click here to get involved. To learn more about donating to The Goodis Center, keep reading below. The Goodis Center for Research and Reform, Inc., is a tax-exempt nonstock corporation organized under the laws of Maryland and of the United States of America. We are recognized by the IRS as a 501(c)(3) nonprofit organization, classified as a public charity under IRC 170(b)(1)(A)(vi). Donations to The Goodis Center may be tax-deductible to the extent permitted by law. We provide electronic donation receipts* to all donors, and gladly honor requests for receipts of donations over $50 by First Class mail. We currently accept donations through a number of platforms. Please feel free to use the service that is most convenient for you, and contact us if you have any questions. 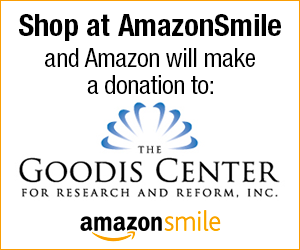 If you would like to help support The Goodis Center for free, please consider checking out AmazonSmile. Use the banner below to sign up for AmazonSmile and designate The Goodis Center as your beneficiary. Then, whenever you shop at smile.amazon.com, The AmazonSmile Foundation will donate 0.5% of the purchase price of any eligible items you buy. To learn more about AmazonSmile, read this. *Please note that we are unable to provide donation receipts for Bitcoin donors who donate anonymously with direct wallet transfers. If you need a donation receipt for a Bitcoin donation, please use the Bitpay donate form and include your correct contact information at the time you submit the donation. Please also read about our Commitment to Transparency. Financial disclosures will be posted under our Commitment to Transparency page as they become available.